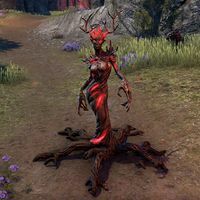 Nirnblooded Spriggans are variations of spriggans found in the Jerall Cleft of the Bloodroot Forge. They can also be summoned during combat with Mathgamain, Caillaoife, and Dreadhorn Firehides. Blood for Blood: Neutralize an ancient forge and put an end to the evil plans of the Dreadhorn Clan. This page was last modified on 4 March 2019, at 00:29.